Hey, this prize pack has a few last chance/only chance items. The Hungarian vol 16 HC (#40/100) is the only copy I have to give away and comes with a signed and numbered bookplate. This prize is complements of Krash01 and http://www.vadviragok.hu/. The RCCC 2016 badge is the last one I have, as is the old-color cloissone pin. As always, thanks to Stan for all the items he has donated for these giveaways and for signing the piles of stuff I bring him at conventions. The giveaways wouldn't be possible without his generosity. Also, thanks to all of you for participating and making this a great forum. *Participate in the weekly trivia as you normally do. *The winner or winners (if more than one) of the weekly trivia will be entered into the monthly prize drawing. If you win a weekly trivia question and don't want to be entered into the prize giveaway, just PM me and I'll exclude you from the randomizer at the end of the month. *The winners of the trivia that ends during the prize months are eligible. If a trivia question ends on a following month, you will be entered into the next prize pack pool. *As people win the weekly trivia contests, I'll update the list of all the winners (in the order they won) and then use a random number generator (https://www.random.org/) to select the Prize Pack winner. *I will announce in this thread who the prize pack winner is and contact them via PM for shipping info. International participants are welcome to play along. *Participants can not win two prize packs in a row, but they can still play the weekly trivia any weekly wins on the month after a win will not count as an entry into the monthly prize pack. Back to back wins are rare, but I want to make sure that with the small number of players we have, the prizes get spread out a bit. Thanks for understanding. *These rules are subject to change on subsequent months if there are bugs to work out. Last edited by jabba359 on Mon Apr 08, 2019 17:33 +0000, edited 6 times in total. You can remove my name from line 2. I didn't officially enter Maka's contest. I was aware of the answer but I didn't play hoping someone else would play/win. I’m totally not familiar with this HC Edition. Can I get some info on it? I assume it is a standard volume 16 Shrouded moon but from Hungary? Where did that CBLDF/TFAW signature card come from? When was it released? I’ve never found one or seen one pop up for sale anywhere. Was it a common thing and I just missed it? Trevis Woods wrote: I’m totally not familiar with this HC Edition. Can I get some info on it? I assume it is a standard volume 16 Shrouded moon but from Hungary? That is a special limited edition hardcover of Shrouded Moon published by Stan's Hungarian publisher, which is s/n on a b/w tip in plate, limited to 100 copies. 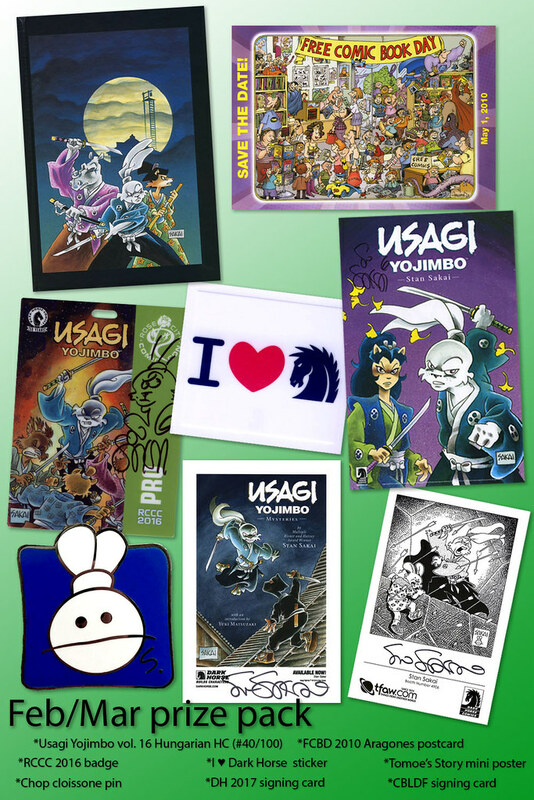 It is the only Usagi book published in Hungary to have both a standard tpb and a hardcover edition. 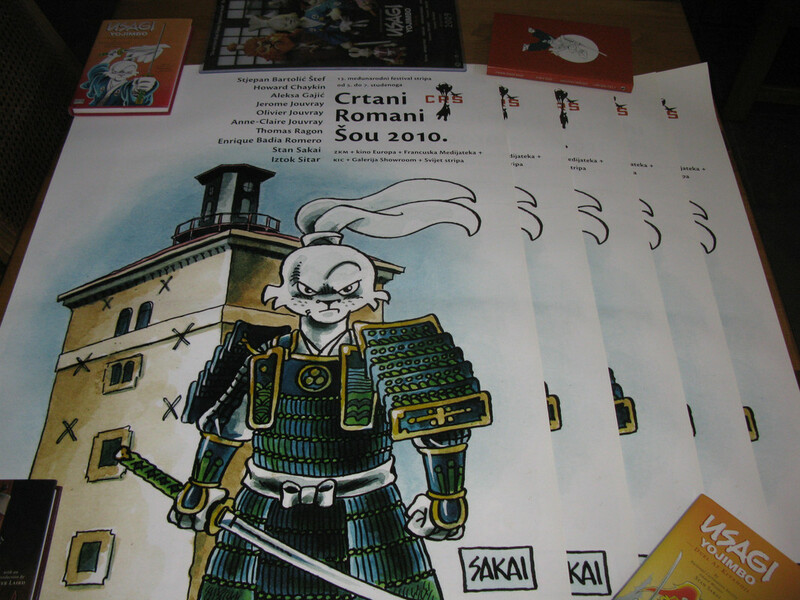 I believe it was released to celebrate the tenth anniversary of Usagi being published in Hungary. Unlike the English ltd edition hardcovers, this one does not have a dust jacket, the artwork is printed on the actual cover, similar to the Usagi yojimbo Saga hardcovers. 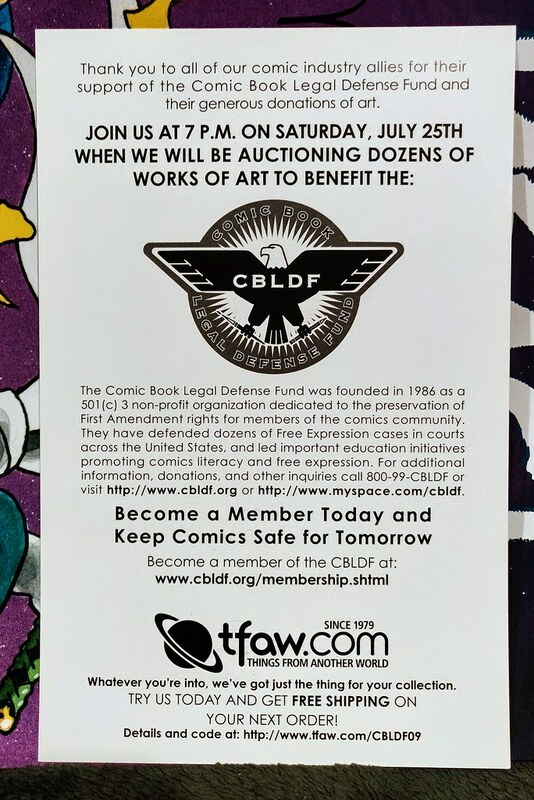 As for the CBLDF/TFAW card, on the back it advertises an auction benefiting the CBLDF in 2009 (TFAW must have been sponsoring the event). I'm guessing by the date (July 25th) and the listing of Stan's booth number on the front that the auction was run in tandem with San Diego Comic Con. Thanks Steve and Kyle...great info! I appreciate it! We've a left a few copies of this book, and I gave one to Kyle last year to include it in the prize pack. These are the Croatian posters I was referring to in another thread. I'll probably add one to the next prize pack. Hello jabba, just checking to see how the final lottery is going! Chopalong Slashity wrote: Hello jabba, just checking to see how the final lottery is going! I'm doing a whirlwind of work through this weekend, then I'll get around to making sure I have all the weekly winners accounted for and do the lottery. I should get back home Sunday afternoon or evening, so should do it that evening or Monday at the latest. I thought I saw the results. Where'd they go? Chopalong Slashity wrote: I thought I saw the results. Where'd they go? Looks like a day for lucky number 7. Chopalong Slashity!